An exotic scented journey awaits . . . . Travel to Indonesia. Samarinda begins with top notes of sweet orange, cardamom and pink peppercorn. A heart of carnation, heliotrope, rose, orange blossom and Sumatran coffee give way to a sweet scotch leather layover fortified by rum ether, jasmine rice, vanilla oakwood and roasted seashell. 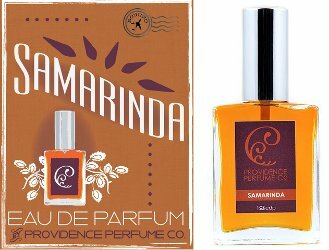 Samarinda is the latest from Providence Perfume Co, and it's a spicy oriental unisex fragrance named for the city in Borneo. When I reviewed Providence Perfume's last fragrance, Branch & Vine, I noted that they were one of my favorite indie natural brands but that I didn't like everything they made. Samarinda now joins Branch & Vine in the 'yes' column, and yes, it lives up to its "exotic journey" billing. The opening is juicy and bright, but already rich and peppery-spicy, and it warms quickly — you can tell you're in oriental territory within seconds. It settles into a floriental in which no particular notes stand out: I catch flashes of clove, presumably from the carnation, and once or twice I thought I smelled bitter coffee bean (it is easier to make out on paper than on skin). The base is woody, dry, and middling-dark (it smells exactly like the color used in the digital ad shown above left). The boozy notes are very lightly done, as is the jasmine rice, which you'll recognize as a gentler cousin of the milky 'rice steam' in Kenzo Amour. The roasted seashell adds a vague hint of smoke, but no more than that. Samarinda is the perfect weight for early spring: not too heavy, not too light. I'm not sure how it will fare in deep summer (it might be too much) but it's been lovely to wear during the still-cold weather we're having here lately (the wind is absolutely howling outside my window as I type). To my nose, it is indeed entirely unisex, and the lasting power is excellent, especially for a natural fragrance. Verdict: Samarinda is unusual and the perfect indie perfume: it doesn't smell like anything else, niche or mainstream. I really like it, and the travel spray, which is nearly free — in the relative, perfumista sense, it is free, since $100 is the new free, right? — is tempting. Branch & Vine is on my buy list and Samarinda will join it there, who knows, maybe some day I'll buy one or the other or both. Highly recommended. The poll: name a fragrance (it doesn't have to be an oriental) that takes you on an exotic journey. Providence Perfume Co Samarinda is available in 7.5 ($35), 15 ($68) and 30 ($125) ml Eau de Parfum; 5% of all sales will be donated to the World Wildlife Fund to facilitate their protection efforts in Borneo and Sumatra. For buying information, see the listing for Providence Perfume Co under Perfume Houses. This one sounds gorgeous, but indie US based perfumes are just to difficult to access from Europe. My tropical fragrance par excellence is without a doubt LesNez Manoumalia. Simply brilliant. Yes — that might be the most exotic floral ever. Manoumalia is tropical perfection. Sandrine Videault did marvelous work there. Absolutely agree – Manoumalia is the real deal and a wonderful perfume. Roasted seashell? Now I’ve seen everything! It’s used in natural fragrances from time to time, never seen it in a mainstream perfume though. This is how good you are, Robin: I *know* we’re virtual ESTs, but still when you write a review like this, I immediately want to sample! I’d have to third Manoumalia with honorable mention to Mahora. And is that a typo in the ad copy: “scotch leather layover”? Do they mean scotch heather? If not, what is scotch leather?? It smells leathery in the base (mildly so, to my nose, although I’ve seen other reviews that found it very leathery) so I’m assuming they mean scotch + leather? Plus, it does NOT smell like heather of any sort. But I could not swear to anything, obviously, and I puzzled over that wording too. We do agree on *some* scents though, don’t we? Manoumalia, though, great scent, wouldn’t wear it for anything. Oh, then I must try that! Love that smell. The wind here is incredible, surprised we did not lose power last night. This Providence sounds great but I don’t do heliotrope, perhaps the note isn’t too strong? I can’t think of one scent atm that takes me on a journey, though I am sniffing Terracotta by Guerlain today and I think of a vanilla sno-cone in the desert..not sure how much of a journey that is, lol. But snow capped mountains and dry but fresh air come to mind wearing this. I don’t think it’s strong at all. Glad that worked for ya, lol. It’s like being up at Tahoe..licking a vanilla cone..after chewing some mint gum. How’s that for exotic? lol. There, now you’re at a Cosby stand up show..perhaps in Tahoe:). What a great blast from the past! We grew up laughing ourselves silly at those Bill Cosby albums (not tapes, not CDs). My son still listens to those, but on his iPod. I love Navegar — great birthday scent, and happy birthday! And yes, of course, for science. Thanks Robin! So happy with the Navegar–I felt sure I’d just be kicking myself for sampling something discontinued, so it was such a delight to find a reasonably priced bottle I could point the birthday elves toward And smells great! I’m glad you found something that you really like, Robin. You mentioned “woody” but the notes include oak wood. How strong is the oak note? It is woody-leathery but does not read like a strong oak note to me…really, no notes stick out to me in that way, it just smells like itself, if that makes sense. This sounds interesting! I have never tried anything from this line. As to a fragrance that takes me on an exotic journey, I would say all of the Neela Vermeire Creations perfumes…from their names to how they smell. IIRC, Tabac Citron is the biggest seller? Or was, she’s done quite a few news ones since then. I have somehow overlooked this line…and Olympic Orchids although I now have the sampler box which I have yet to crack open. Yay, I needed another enabler’s pin! I love the seashell extract Choya Nakh in Aftelier Tango, so I should give this a try. Also I should give the line another chance. I tried a couple of samples that I did not care for, and since you’ve found some much better than others, it’s worth another go. The intense and creative natural perfumes from Via del Profumo take me on a journey, especially Mecca Balsam, Sharif and Hindu Kush. Amouage in general takes me to another plane, and Homage Attar (rose, oud and frankincense) is particularly exotic. And Via del Profumo Tawaf….love that one. Hove Habanera bought from the shop in New Orleans. A beautiful powdery tobacco leather which takes me back to that amazing city all the way from Australia. I heard it’s a foodie paradise! Great food, and also lots of great cheap food which is a bonus…although I haven’t been there since Katrina so don’t know how much it’s changed.